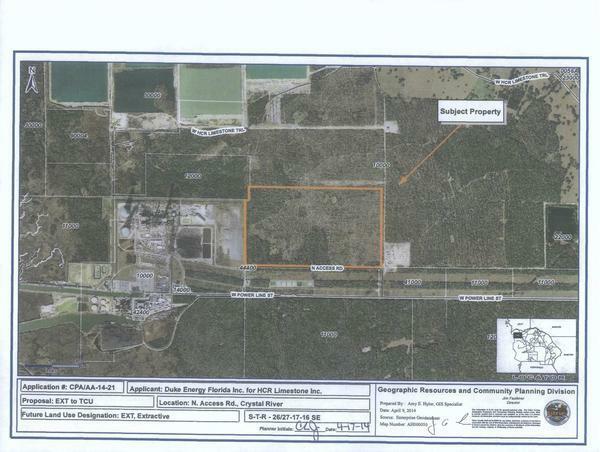 Duke Energy to hold Crystal River, FL gas plant meeting same day as Leesburg, GA pipeline hearing. Curiously Duke is not calling it the Crystal River plant, even though it’s right next to Duke’s failed Crystal River nuke. Duke first said this plant would get its gas from the Sabal Trail pipeline and then said nevermind, that wouldn’t be needed, even though Sabal Trail has a Citrus County offshoot pipeline as part of its $3 billion project. 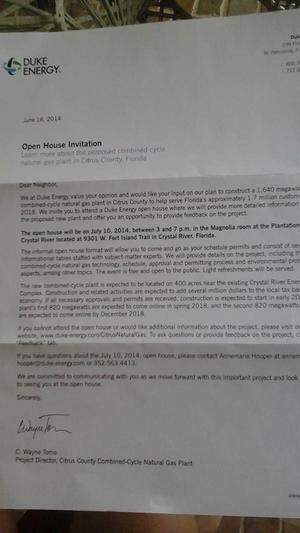 Now this letter says it’s Sabal Trail fracked methane for Duke again. Hey, instead, why not build solar power in the Sunshine State? 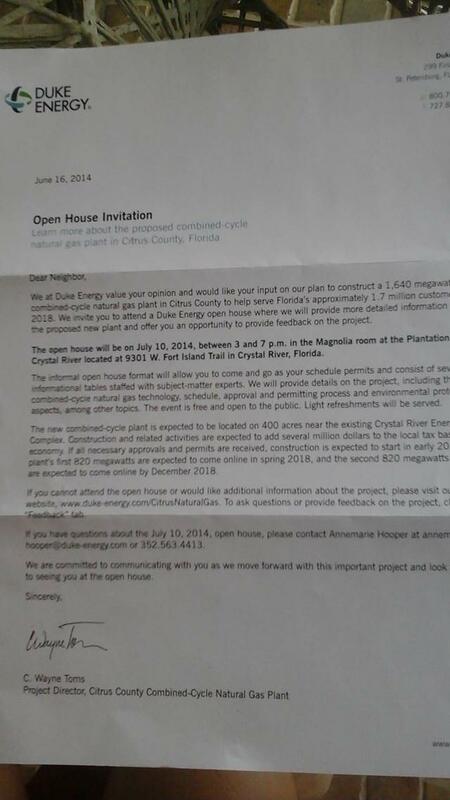 CRYSTAL RIVER, FLA. – Duke Energy Florida has scheduled an open house on the proposed combined-cycle natural gas plant in Citrus County. It will be held Thursday, July 10, 2014, between 3 and 7 p.m. in the Magnolia room at the Plantation on Crystal River, 9301 W. Fort Island Trail, Crystal River. The purpose the event is to provide information about the project, including the combined-cycle natural gas technology, project schedule, approval and permitting process and environmental protection aspects, among other things. The event is free and open to the public. The informal format will enable attendees to come and go as their schedule permits and to interact with several subject-matter experts. Light refreshments will be served. On May 13, 2014, Duke Energy Florida announced plans to construct a new, state-of-the-art, highly efficient combined-cycle natural gas plant in Citrus County to supply 1,640 megawatts of generation to help serve Florida’s approximately 1.7 million customers in 2018. Building a natural gas plant is the most cost-effective option for Duke Energy Florida to satisfy customers’ future demand, provide systemwide reliability and meet the company’s 2018 in-service construction timeline. The new combined-cycle plant will be located on 400 acres near the existing Crystal River Energy Complex. If all necessary approvals and permits are received, construction is expected to start in early 2016. The plant’s first 820 megawatts are expected to come online in spring 2018, and the second 820 megawatts are expected to come online by December 2018. Construction and related activities are expected to add several million dollars to the local tax base and economy. During the height of construction, the company anticipates 600 to 700 construction jobs to be created. Once construction is complete, 40 to 75 workers will be needed to operate the plant. The plant is expected to receive natural gas through a proposed new pipeline Sabal Trail Transmission is constructing. The pipeline will start in Alabama, extend through Georgia and end in Central Florida. Sabal Trail Transmission will license, construct and operate the natural gas pipeline. For more information on the proposed combined-cycle natural gas plant in Citrus County, go to www.duke-energy.com/CitrusNaturalGas.